I feel fortunate to have been raised within the trucking industry. 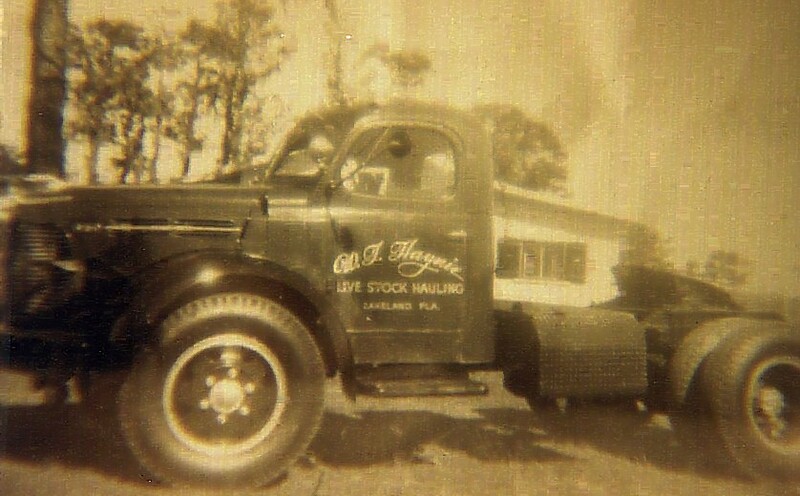 My father hauled livestock in the 1950’s; then in the 1960’s while managing the logistics of a fruit company (Alva Fruit Co.), raising a family, and directing a welding shop (Southwest Welding) he maintained a couple trucks ‘on the side’ for lease. 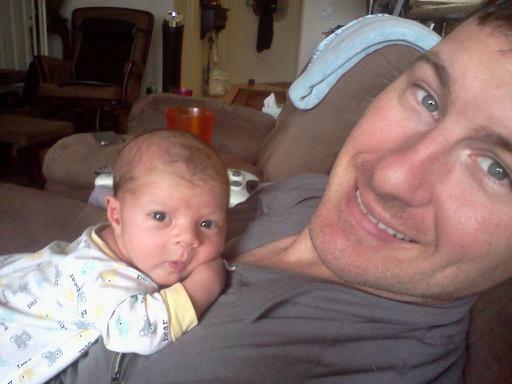 When his main occupation faded, Dad returned full-time to driving in the late1970’s. For the next twenty years he transported live plants from growers throughout Florida to (MCT) Sanford Fl for further distribution. 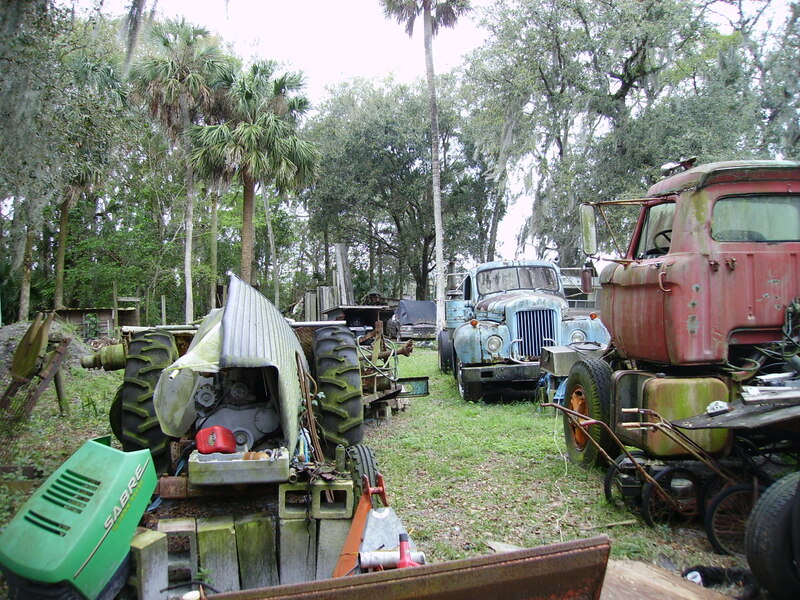 Dad was retired at 66 years old with a yard full of iron relics from the past to wander around in; after an accident at 80 he could no longer operate a vehicle – it was the beginning of the end. 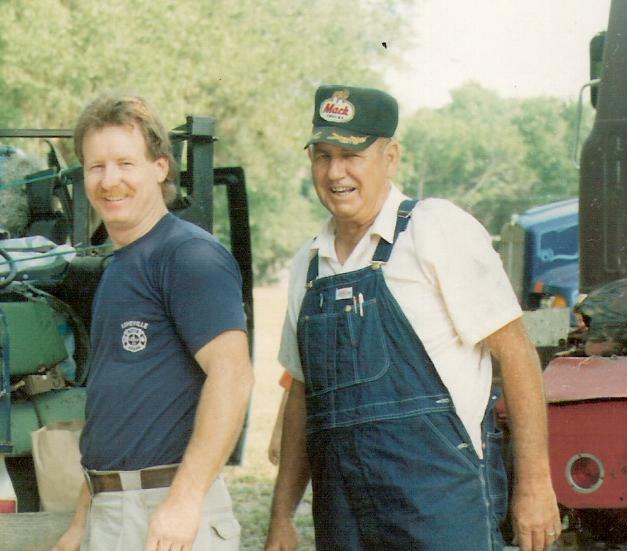 Dad passed at 83 after living his interest; ‘trucks’ (W.T. Haynie 1926-2010). Dad worked, period. He had no time for sports – so I too was influenced in the same direction. I drove ‘long-distance’ for better than 6 years before finding a more fortunate career as a firefighter for the City of Asheville, NC. – Dad’s regard with firefighters had more to do with them lazing around the station, and would have preferred that I stayed with trucking.. This writing came about because my son had a period where he was consumed with ‘video games., “There’s a whole-world out there” and I wanted him to taste some of it – just as his grandfather and I had. That exposure led me to mechanical independence – if I could take it apart; then I could put it back together again (fixed). 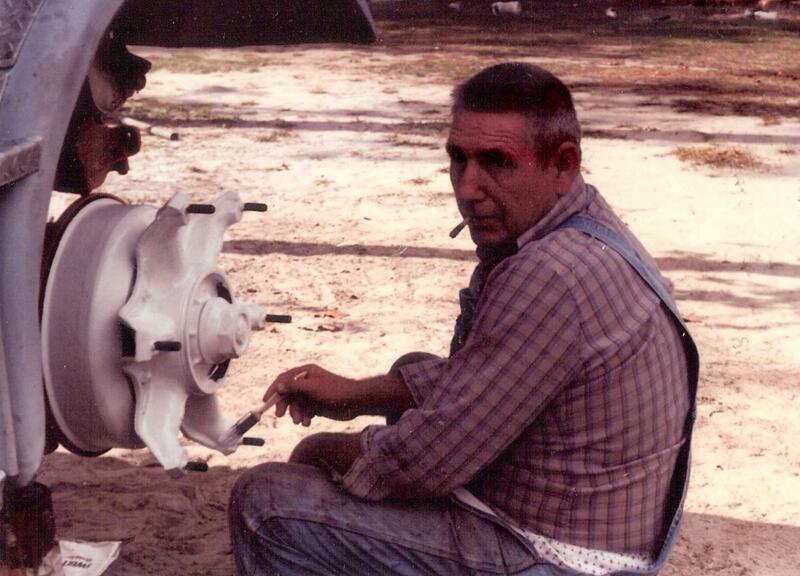 At eighteen (@1970) Dad helped me land a job preparing semi-trailers for the ‘team-drivers’ of Terminal Transport. 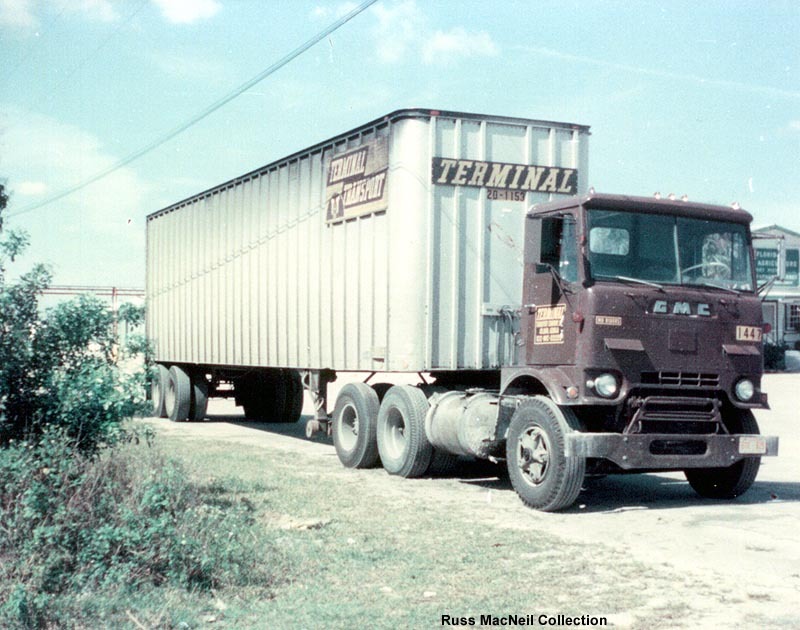 During the South Florida flower season I prepared and loaded three to five 40-foot semi trailers, six nights a week; with boxes of Gladiolus bound to the Northeast or Midwest. Using a single axle 1800 International tractor, it was my duty to service those put-puts; checking the gas/oil while making sure that all was greased and working properly. The trailer had to be swept out and tar-paper attached to the bulkhead (so the boxes would not get wet from the condensation of ice) before taken to the ‘ice-house.’ At the ice-house it was necessary to maneuver the trailer at a right-angle (“jack-knife”) into the dock so that ten-300 pound blocks of ice could be carved and thrown into the small doors at the top of the bulkhead. The plant workers did this part; block-ice worked for this type of load; it lasted longer. As a side note; crushed or ‘blown’ ice was commonly used and blown directly on produce loads like field corn where quicker cooling and the water from the melting ice wouldn’t damage anything. The skills that I gained from this experience provided a wealth of common sense, I learned quickly and enjoyed the tasks. As a bonus there were occasions when it was necessary to take one of those loaded trailers to the Sanford terminal 200 miles north; and occasionally two had to go; Dad would take the other one. Maybe I just loved the ride. With most of my Dad’s friends lingering around the Farmer’s Market Restaurant in Fort Myers, it wasn’t long before someone asked me to drive distance (Jack Williams and Bill Millican), Why not? 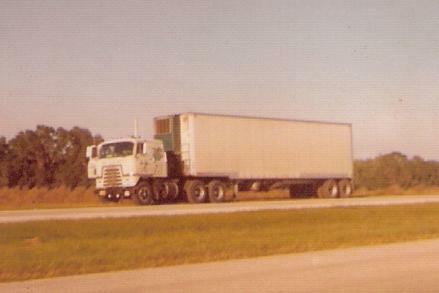 So from 1970 until 1976 (with some other driving jobs along the way) I delivered produce throughout the Midwest and east coast; following the crops of the seasons northward. The truck was my apartment and the windshield was my view to the world. Weigh stations were a nuisance, return loads a hassle, and sleeping in cold and unusual settings were just ‘a part of it‘ – other than the hassle of the DOT (transportation enforcement)- I enjoyed it all. 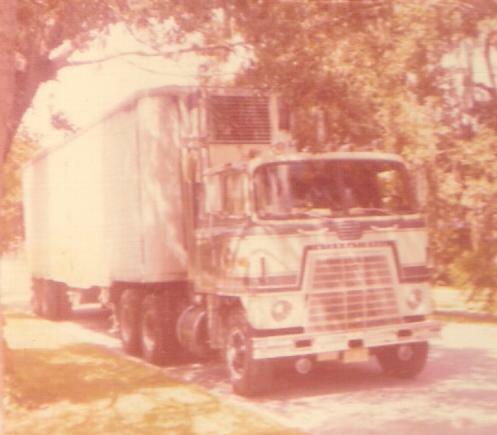 My ride 72 -76 Milson, Inc.
As my friends attended college – my education was through the windshield of that truck. After six years living on the road I met my future wife while delivering produce in Delaware; we became engaged. A year later and a month before our wedding – I stepped out of the truck and hitchhiked back to Florida; a new life. Yes, I found a job away from trucking – but not away from trucks. I will always believe that the sound of trucks idling, the smell of the diesel, those amber lights against the midnight darkness, and the myriad of experiences from a truckers life never leaves a drivers thoughts and senses. Over the following years, they never left me. – and yes, on a few maintenance trips, my son ‘Gray’ followed along too. A few summers later and at 13; I searched for a way to pull my son from those ever consuming video games; I could think of no better place than to become ‘stuck’ together in the cab of a truck. I felt too that this could also be an opportunity to review some of those familiar places (close a few of those ‘little circles’) that had remained in my thoughts from years past. Thirty years before I had encouraged friends to ride along; several did. 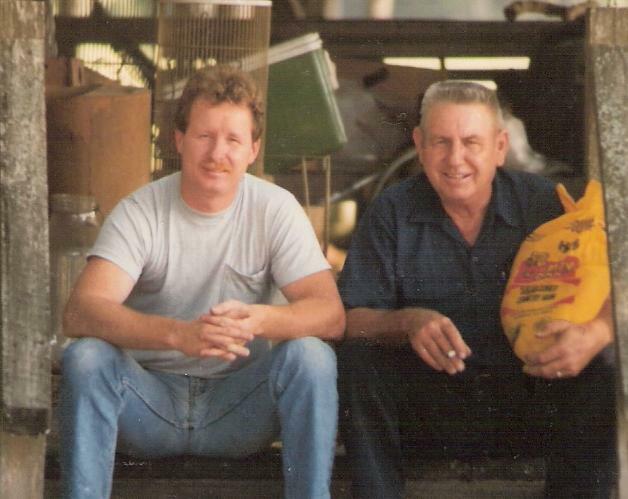 One of those friends who took the ride was “Dewey,” our fathers were acquaintances and both solid ‘Mack” men – over many years our friendship has been an easy and lasting one. 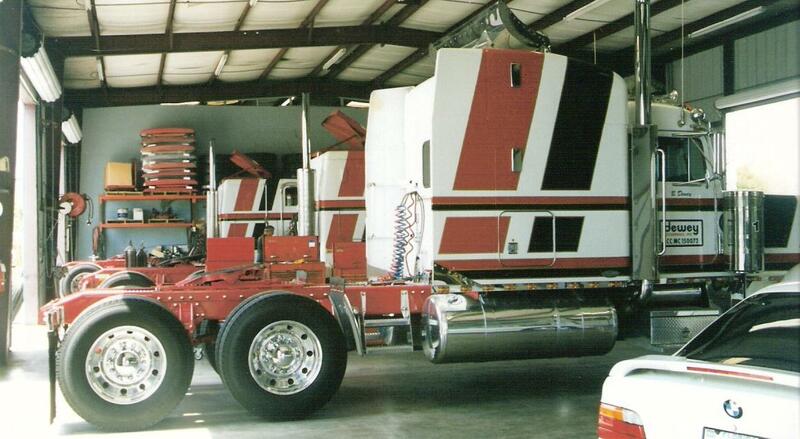 Bruce had succeeded in the trucking industry and now owned a fleet of more than thirty trucks. After a quick phone call to see if he could use a temporary driver I secured a month of vacation-time from the fire department and drove to Florida with my son. 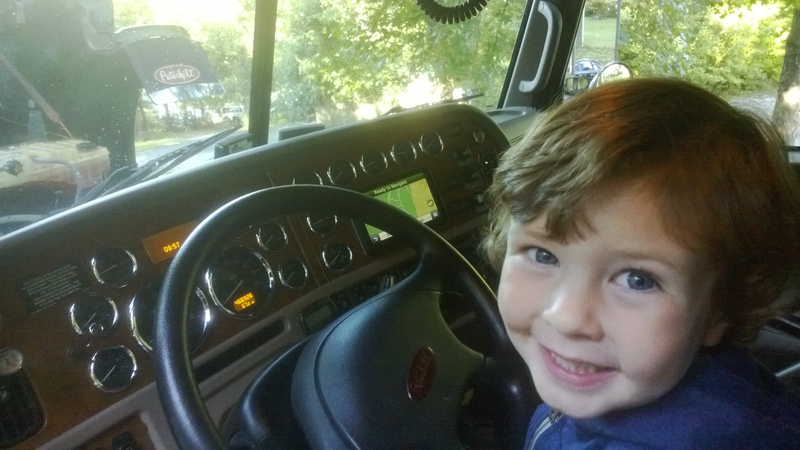 Bruce had prepared one of his older Pete’s along with a Great Dane trailer, and at 8:30 in the evening, thirty years later – I was once again sitting in the drivers seat – this time my son accompanied me. We ‘dead-headed’ north from south Florida to South Carolina for a load of Tomatoes. Making my way up the interstate it was all coming back – the hum of the engine, the feel that comes with the constant of scanning the gauges, the mirrors, and then ‘defaulting’ back through that big picture-window to the highway ahead; diligently aware of my surroundings and the overall pulse of the iron beast beneath me. But years later there was indeed something different – ‘air-ride’ suspension, there was a lack of engine noise and vibrations, and while at a casual 72-mph; this machine seemed at ease. I felt air-conditioning! I could also hear the radio, all while the large Cummings ran with a quiet hum – heck, we even had a cooler with refreshments in the cab. 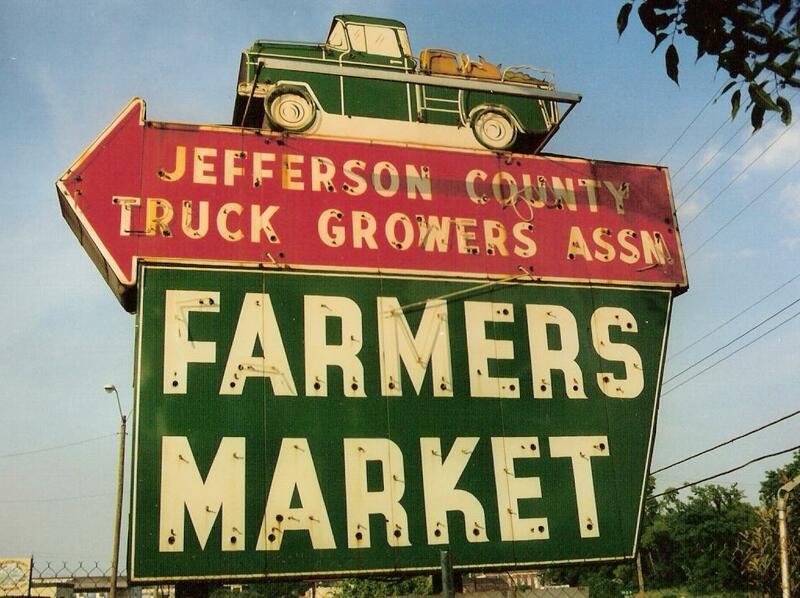 The only thing similar with this truck from those I had experienced more than twenty years earlier – were those juicy southern bugs that continued to slam against my windshield. You have to understand the difference, the old H-67 Mack that Dad first sent me off to Baltimore/Philly/and New York in was a ‘sweat-box’ that struggled to maintain 55 (mph). It’s doors rattled, the steering wheel shook, and the air roared through the open windows – having a radio was useless. Another truck I had driven (“Betsy-Ross”) had the fuel ‘turned-up’ for more power and when running wide open through the night, it was possible to see (from the ‘spot-mirror’) a flame curling out of the ‘stack’ against the dark sky. Once again, I wondered if could I ever share these things with my son. I suppose it didn’t really matter; for as I absorbed these muses of trucking my son had crawled up in the bunk and was fast asleep behind me. I continued through the dense patches of N Florida fog – hands gripping the steering wheel into the wee hours – and my son slept! Hours later I arrived at an old truck-stop near my destination and rolled back in the sleeper for a few hours sleep – it was then that I found that sleeping in the same bunk with my son was like resting as an angry forklift driver loaded your trailer (the whole rig lurches with each forklift pass). After several hours of this punishment I wearily climbed from the sleeper and slid back onto the driver’s seat; my son remained undisturbed. Leaning across the large steering wheel I gazed through the dried bugs on the windshield across the dusty parking lot – there was a melody of idling trucks surrounding us – once again reminding myself – ‘this’ was for that guy in the back – my son. It was still early when we located the packing house and backed the trailer against the loading dock; once again I would try to rest. After all the sleep the boy felt just fine and decided to explore. The area was rural and I felt that it wouldn’t be much different than I had done years before so after reminding him to be careful and to remain close I settled back into the sleeper for some much needed zzzzz’s. Through-out the next hours the boy continually pulled his 150 pound frame up and down the cab getting in, slamming the door, just to climb out and repeat the motion all over again. Once again sound sleep was a loosing battle. And once again I reminded myself that this time was for him; so I just laid there – and tried to rest. Soon the truck lurched with the feel of the packing house fork-lift and the first pallet, so much for rest now. In no time at all there were 20 pallets of tomatoes on the truck, 1600 individual boxes of palatalized tomatoes (80k gross); thirty years prior a load was 1225 boxes stacked directly onto the floor (73,280 gross). Birmingham was our destination and with paperwork completed and with the modern cooling unit set at 58 degrees – we set out at 5:30 in the afternoon. I wondered if the Birmingham Market was anything like it was twenty five years earlier. The 450 miles was a short hop across two states on the interstate, a simple task as compared to the 22-hour ‘overnighters’ that as a young man I had regularly driven from south Florida to the markets in Boston, Chicago, Detroit, or New York City (Hunts Point). Trips then were accomplished on incomplete interstates, now it all seemed easier – the ease of the truck, the rate of travel; and just to remind me that it was not a dream – were the regular ‘thumps’ of the pavement and the splattering of bugs against the windshield. I had once driven for two years without working wipers on a truck; by simply keeping the windshield ‘waxed’ rain bounced off as quickly as it struck – it never seemed to present a hazard. The trucks I had first driven were a lesson in humility; for some reason it was important to my father that I learned to accept and adapt. In this late model truck, we were able to maintain a steady pace into the Georgia night; at one period we had fallen in with a group of freight-haulers. These ‘company’ drivers run hard and steady between the ‘hubs’ or terminals of the larger cities, and on this night they helped me to maintain a rigid pace towards Atlanta. It was during this period that I noticed my son was no longer sleeping or playing his ‘game-boy’ in the sleeper; he was actually sitting in the other seat observing! I began to think that he might actually get something out of this ‘vacation’ after all. I felt fine, and with all those freight haulers bearing down from behind I wasn’t about to stop and loose what little highway I had just earned. I told my son that he may want to seriously consider one of those plastic 20 oz tea bottles that he had been so eagerly ‘downing’ all day (and discarding so casually on the floor) – he rejected the idea and I told him that was fine, but for the moment that was the only reasonable choice that he had. After a few more bumpy interstate miles he must have reconsidered because an arm soon came from the sleeper curtain and the boy asked if I could hand him a second bottle – we never had that conversation again; he learned to adapt. Another lesson from my father was that “eating-on-the-road.” This term didn’t always mean dining out – it could very well mean that ‘crackers and peanut-butter’ were in the glove-box. Simplicity shared – somehow, this just might work. Four am, the Birmingham market on Findley Street; I had been there many years earlier, Would I recognize it and would it be the same? Out of the morning darkness appeared the image that was etched in my memory, the place indeed had remained fundamentally the same, except now many years later – I had returned with a son. I paid the guard and backed my trailer against the dock, worn out from driving and without sentiment I shoved my sleeping son against the wall as he slept, and settled into a head-to-toe sleeping arraignment. My mind wandered as I searched for comfort on a cramped mattress, but once again I found similarities. Trucking; dirty-teeth, needing a shower, an engine running beneath me, area lights shinning through the windows – and here I lay. I’d been here before, but now I questioned myself – Why in the world am I here now? I continued to settle and as I shoved my son’s size 12 feet away from me; I was reminded of the reason – it was for this guy. 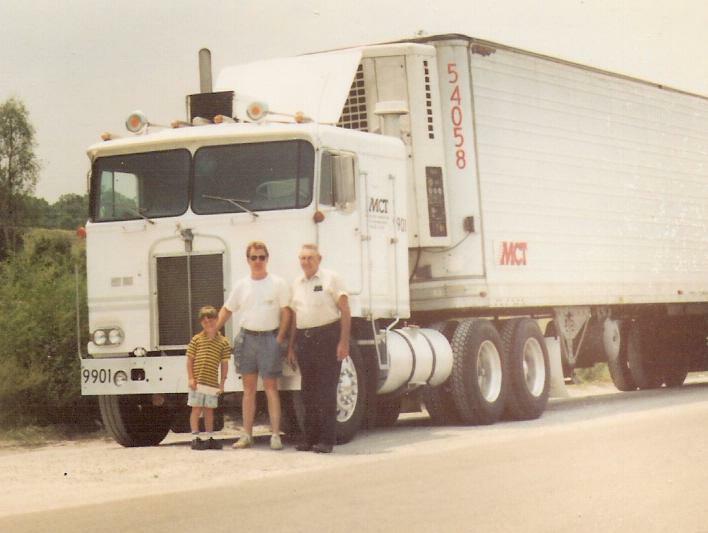 In my twenties it was my ‘job’ and I readily accepted trucking as a paid adventure; now at 45 it was a father/son thing. I felt lucky for the opportunity to share my adventure and past with him. Unloading was quick and painless, that was different too – we then drove to Tuscaloosa for a load of roofing material. Years before, PURE (now Union 76) was the ‘king’ of truck stops, what I was about to learn was that modern truck-stops have much higher standards. The facilities we visited now were clean, organized, and offered friendly service – ‘travel-centers.’ After a much needed, sh-shower- and shave, it was time to head for North Carolina with our load. As we pulled back onto interstate-20 towards Atlanta I felt much better. The boy was a bit happier too after spending a few bucks at the truck-stop arcade. The next few hours went quickly chatting on the CB and darkness fell, nearing Charlotte; more freight haulers and ‘chicken-lights’ surrounded us. Then at three am and after 600 miles I find my delivery point out; open my rear doors and park just outside the business – once again I shove the sleeping boy against the rear of the cab and squeeze in. My son was up when the forklift began unloading and once again I was in that all too familiar position; the driver’s seat, elbows on the steering wheel, dirty teeth, and gazing wearily through the smashed bugs on the windshield. Yes, I thought about home, those bugs, and my own bed; even the thought of the wife snoring did not deter my desire to be alongside her – but again I reminded myself of the father/son thing and exactly why I was doing this. We were soon off to Williamsburg, Virginia for a load of beverage; load time 30 hours away, wonderful, ez ride, no hurry. The rest of the afternoon we eased through eastern North Carolina along highway 258, I had driven this road many times earlier hauling cucumbers to Delaware and was curious of the changes; it seemed like the perfect opportunity. The son was actually sitting up and watching the fields and rural life style of eastern NC pass before us (I learned later that the batteries were dead in his game-boy!). 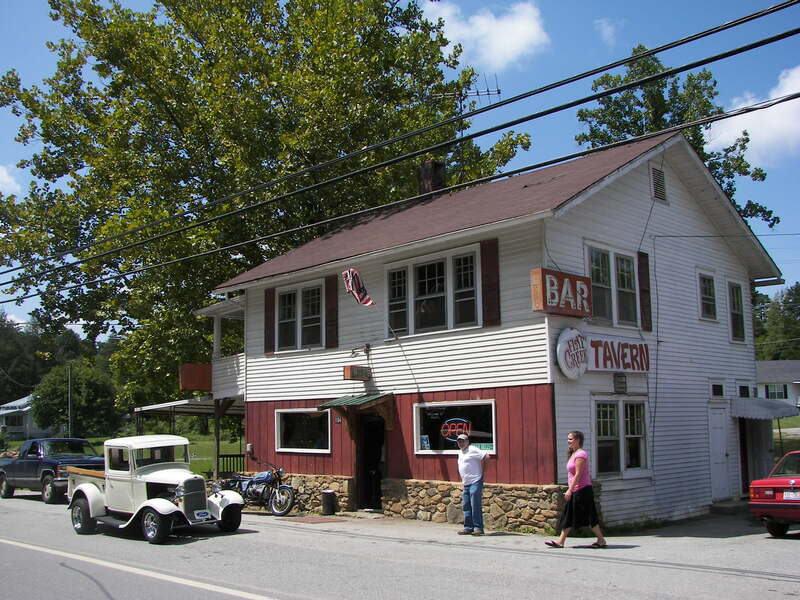 It turned into a pleasant ride; the small towns remained as I rmembered; each town a “Mayberry” in its own right. As evening fell we came into the traffic frenzy of Portsmouth, Virginia. Gray was commenting on the shipyards, the ships and of the world that he was seeing – he even made the analogy that like “Dad, this windshield is like a big TV set,” and that he was really enjoying what he was witnessing. That comment sure helped to ease the fact that I had missed my shower for the day – just maybe these weeks were going to be worthwhile, and just maybe sooner or later I will get rested up. Williamsburg, Va. I had heard that there was a truck stop near the load point, so that was my destination. A I pulled into this dusty little dump of a truck stop, my heart sank, it was a time-warp. The facilities were horrid, leaving me no viable options. I was in a zone of too close to my loading point to leave – and too far to go. 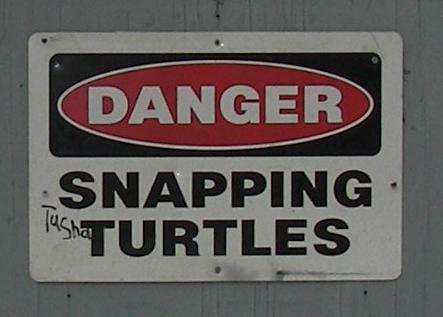 I would remain nearby. I investigated the facilities further confirming my worst assumptions and gave up on the shower. Utilizing my spare gallon of water (a keepsake from Dad), washed my face (birdbath), brushed my teeth and left the dusty lot to find parking. Locating a shopping center nearby the boy browsed the stores. As night fell I was direct when I stated that there would be NO in-and-out of the cab routine, there would be sleep. The next day we were up early and returned to the dusty little truck stop, by this time I had it all figured out how to manage a shower. I wouldn’t touch anything. I propped the door open to vent the stench, flushed the johns, did some minor clean-up and ran the hot water to run the critters out. 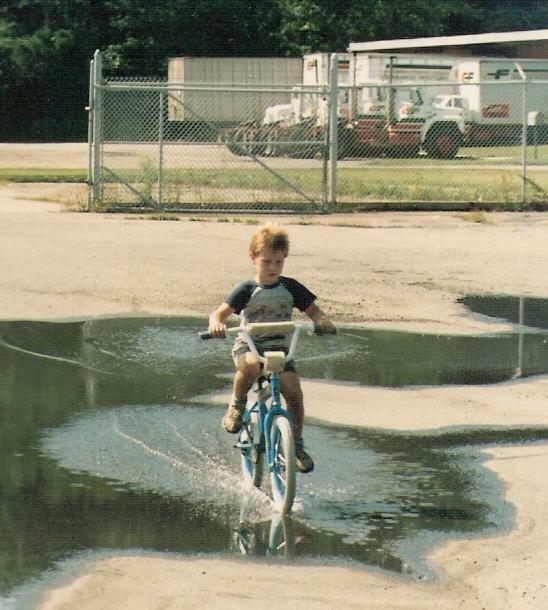 “Wet, soap, rinse, and remove thyself” were my instructions – I made it through, as did Gray. Much like the 20 oz plastic tea bottle; there are times that we must adapt and on this day, we adapted. ‘Frank’s Truck-Stop,’ the place was despicable, and I think you may have already noticed that my standards are not that high. We spent the rest of the day working crossword puzzles, cleaning the cab of the truck, talking, and sitting with our doors open while observing the world outside – quality father/son time. Our load was beer from Anheiser-Busch to Miami, once loaded we proceeded over to and then down interstate-95 south into the Carolina night. I drove for hours, my four a.m. stop at the Brunswick Georgia truck-stop was to be a 20-minute nap but four hours later I awoke. We entered the truck-stop to find a wonderfully clean shower and a down home country breakfast, once again I felt clean, refreshed, and rejuvenated. Having a Monday delivery and being in no hurry for Miami we headed towards Sanford to visit my father. 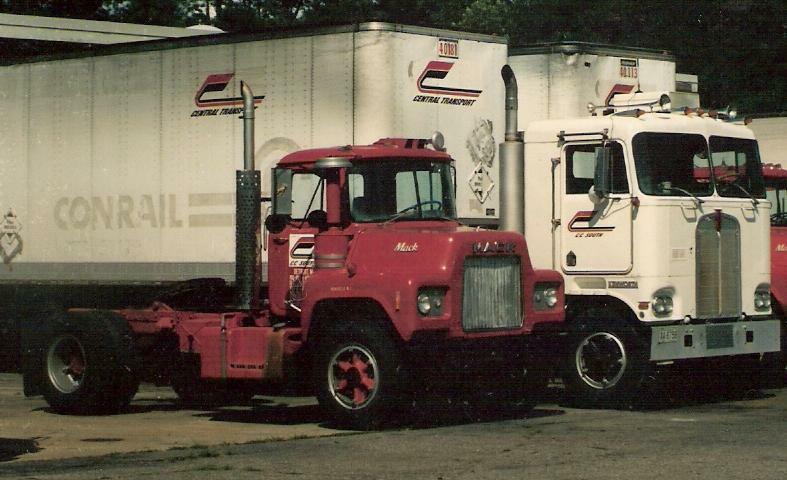 Dad had retired years earlier from trucking, and with great pleasure I pulled unannounced onto his large yard; and with two graceful motions – backed that shinny 48 foot trailer in-line with his long-idle fleet. The smooth evolution never broke a rut in his manicured lot, and as he walked from the shade of a nearby tree, I yelled “guess who taught me that?” It was a nice grin, and the first time I had seen his new teeth. 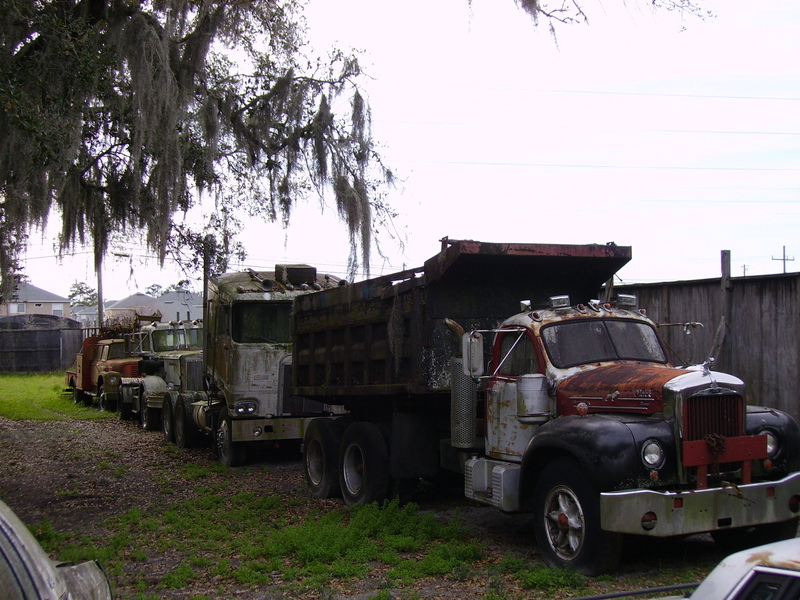 As we wandered through he would share elaborate plans for each of the trucks – for each piece held special value or history to him. Dad never hesitated to stop, unzip his britches, and tuck his tobacco scarred shirt back into his pants – and then it was time to roll another Prince Albert cigarette. For being such a young man, Gray must have understood the importance of this rare visit with his grandfather because he showed a great deal of patience and seemed to enjoy the time, as did I. When the darkness fell, we said our good-byes – Dad had driven for years and understood our need to move on through the lighter traffic of the night; bitter sweet were the feelings as I drove away – we don’t see him enough. The highways now were the ones that I had traveled as a boy with my father; so I intentionally avoided the convenience of the interstate and pursued the ‘old routes. Through the small towns and familiar highways, the lonesome stretches of road where my father once came to my rescue many years prior – the truck I was driving at the time was overloaded and had two flat tires, almost turning over – Dad came alone in the middle of the night to get the rig going – he always succeeded. It was night time now, as and as I passed the area of highway I retold the story to my son. To shorten this long story we unloaded the truck in Miami and made another trip or two for Dewey, the truck and trailer were returned undamaged and we felt privileged to have had this rare father/son opportunity. On our drive back to the Carolina mountains, I reflected on what we may have accomplished. It didn’t have a thing to do with the changes that I had noticed with the trucks, bugs, bumps and highways, but it did have a lot to do with the similarities of what fathers want and like to share with their son’s. It was a special time, sharing a month of three summers as my son was able to live and touch a very important part of his father and Grandfather’s past. 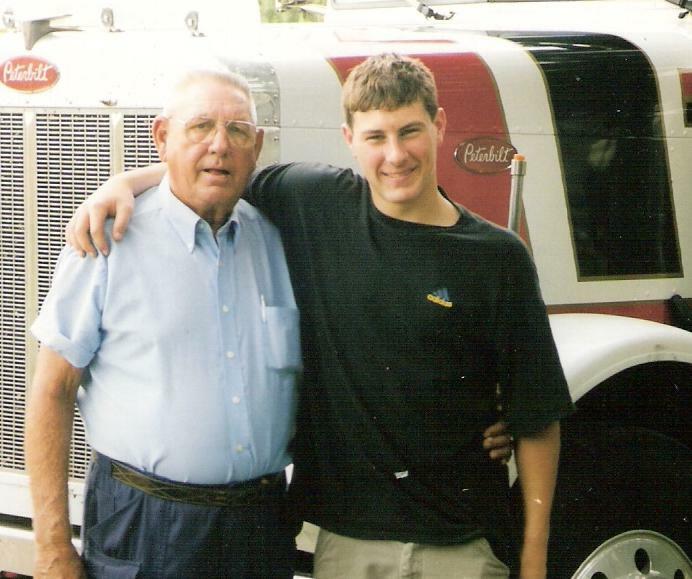 It was a ‘vacation’ that hopefully he will never forget – I won’t..
Cliff, Dad thought alot of that truck – it was the one he drove until he retired and he was real proud of it. He had a coffee pot hanging under the front bumper (thought it was really something) as he hauled plants from throughout Florida to the terminal in Sanford with it. He would crank it every now and then just to watch the exhaust rise from the stack. 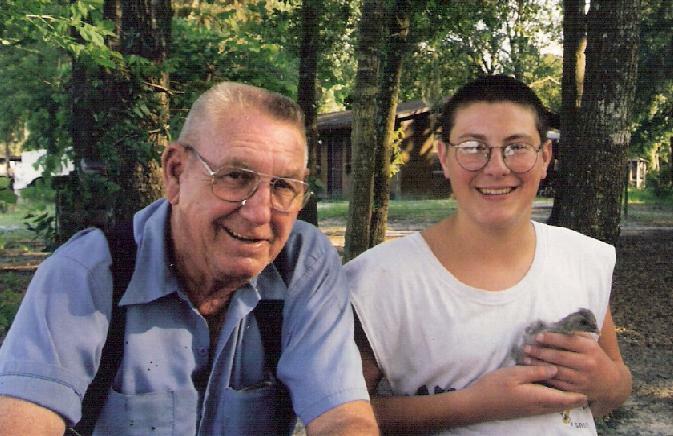 Dad passed in 2010 ( https://tomhaynie.wordpress.com/2010/02/18/1926-2010/ ). The children of his caretaker got the equipment – I always figured he might hide something special in that truck. Is there a ice house near Brunswick, GA that my driver can get a load of corn iced. Your help is greatly appreciated. 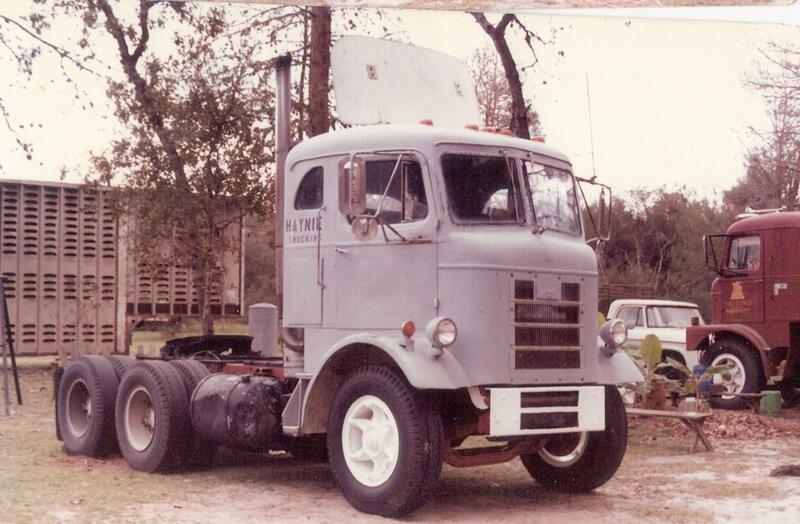 Ran across this post by accident and noticed a picture of the truck my daddy drove when he worked for Bruce in Ft. Myers!!! Sure brought some memories and some tears!! !